Please join Linda B. Sherby, Ph.D., ABPP, SEFAPP’s Co-President and Donna Bentolila, Ph.D., LCSW, Past-President, for their colloquy, Ethical Dilemmas: Ongoing Treatment and the Potentially Violent Patient, at the Division of Psychoanalysis Spring Meetings in Atlanta April 6 – April 10 2016. 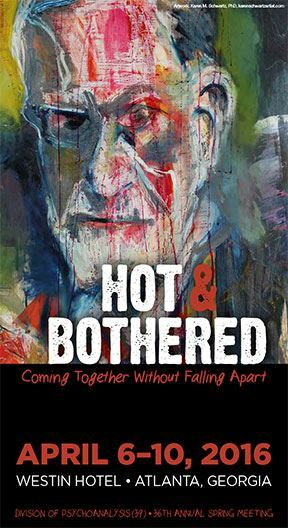 The conference is entitled Hot & Bothered: Coming Together Without Falling Apart. This colloquy captures the essence of two analysts torn between the terror of destruction and the trust in the power of the relationship. So how does an analyst deal with a long-term patient she sees as potentially violent? Although the relationship with the analyst can provide a strong counterweight against destructive acting out, it may be insufficient to prevent a serious aggressive act. Should the analyst contact the police? Should she inform the potential victim or victims? Hospitalize the patient? And what happens to the trust in the therapeutic relationship if the analyst pursues any of these paths? In this colloquy Drs. Bentolila and Sherby will address these questions in relation to their treatment of two seriously disturbed patients, one psychotic, one with dissociative identity disorder. Both patients were in long-term treatment; both had long-standing and significant relationships with their analysts. As the psychotic patient became more aware of the malignancy of his relationship with his mother, his rage intensified and the analyst became increasingly concerned about his potential to retaliate. The second patient had been horrifically physically and sexually abused as a child by several family members and threatened to return home and kill them.